With all the reports about unrest within the Manchester City dressing room, what has almost been lost has been the teams performance recently. After beating West Ham 3-1 today, City moved into second place in the Barclays Premier League. City were without the suspended Carlos Tevez’s, but they still have David Silva who was brilliant again today. With Silva pulling the strings all over the park, City were well on top when Yaya Toure scored on the half-hour mark to put City one up. 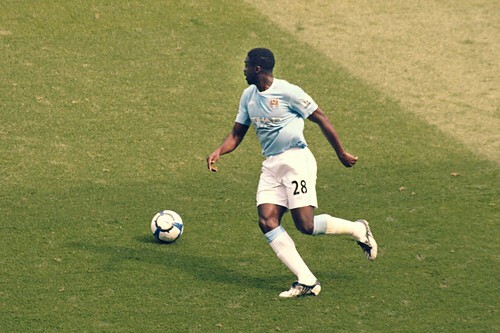 Toure then created the second in the 73rd minute, cutting in from the left and firing a shot against the post that rebounded in off the back of Green. Substitute Adam Johnson netted a third with nine minutes to go before James Tomkins’ late consolation for the Hammers who are rooted to the bottom of the Premier League. Blackpool’s fine form continued as DJ Campbell’s strike three minutes into the second half earned them a 1-0 win at Stoke. After Luke Varney and Charlie Adam linked up, Campbell was on hand at the back post to complete the move with a deft finish and Blackpool have now been beaten only once in seven matches. So much for the experts who expected them to get relegated this season. In the big second city derby, Aston Villa eased some of the pressure on their manager Gerard Houllier by beating West Brom 2-1. Stewart Downing put Villa one up in the first half and Emile Heskey made it 2-0 in the 80th minute with a stooping header. Paul Scharner pulled one back for the Baggies with a minute of normal time remaining but Villa held on for all three points as they move four points clear of the relegation zone. Everton remain two points clear of the bottom three after they were held to a goalless draw at Goodison Park by Wigan. It’s a mystery how Everton failed to score in this one. It seemed that every Everton player had at least once good goalscoring opportunity in the game, but the closest they came to a goal was asecond-half header from Tim Cahill which came back off a post. The draw means Wigan stay 18th, still only separated by goal difference from 17th-placed Fulham, who also drew 0-0. The Cottagers played out a stalemate at home against Sunderland, whose defensive problems increased with the loss of Anton Ferdinand early on due to injury.